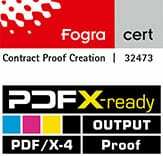 A soft proof is – in contrast to the classic “Hard Proof” on paper – a proof, which is soley displayed on a monitor. The advantages of a softproof are obvious: It is fast, does not produce costs for paper and ink and is reliably reproduced with little effort. In addition, monitors have a very large color space and can be quickly linearized and calibrated if necessary. The disadvantages: Especially when controlling the print, a comparison of a paper proof to the final print is significantly easier than the comparison of a self-luminous image display with a passive illuminated paper. In addition, print control must be done under very bright lightning (2000 Lux) according to ProcessStandard Offset; for Softproofs on the other hand, the lightning must be darkened down to at least 700 Lux, because most soft proofing monitors are calibrated to dark 120 to 180 Candela, some monitors being capable of displaying 350 Candela, but these are not capable to display the entire ISOCoatedV2 gamut. In the long term Softproofing will certainly be established, since the monitor technology is making great progress constantly. Currently, however, a simple hard copy proof is the common solution in controlling print color.